Several months ago, Chromecasts got a new feature that would allow anyone to control any Chromecast device on the same Wi-Fi network. But what this also meant, was that anyone on your Wi-Fi network would be able to see what app you were casting from and the notification would appear during active use of the Chromecast. If you wanted to cast privately, there was no way since Google didn’t include a way to remove the cast notification. That is, until today. Google has updated its Chromecast support page with new instructions on how to turn off the “Cast media control notification” that would allow anyone else to pause, stop, and mute the active cast. 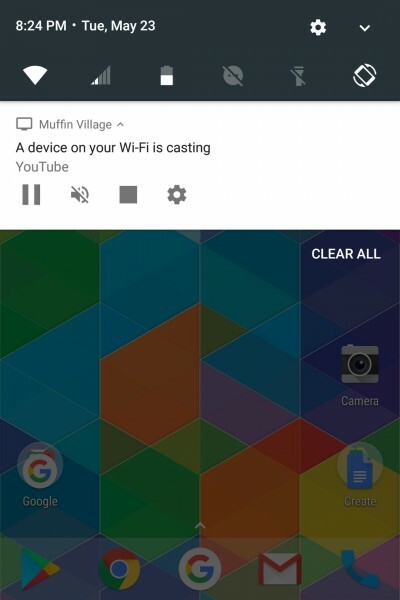 To disable the notification, enter your Google Home app and tap the upper-right corner to see your cast-able devices. Go into the settings of the one whose notifications you wish to disable and then toggle the new option: “Let others control your casted media”. This should stop your Chromecast from broadcasting your streams to all connected devices. The new setting must be very new, as we weren’t able to find the option on our Chromecast Gen 2. You can also disable your device from ever getting cast notification from other devices on your network. For instruction on how to do that, check out the source link.